A unique, horizontal-fed trim scrap grinder that costs less, saves power and provides a superior, virtually splinter free grind for profitable re-sale. Build with years of years of hammer mill experience, so you get more out of it. It's compact, rugged and powerful...and most important, economical to own and operate. Ideal for sawmills, furniture plants and other woodworking operations which produce large amounts of trim scrap. It handles a wide variety of wood scrap - in sizes from 4/4x4x16 feet up to 8/4x12x2 feet - and performs many of the same functions as wood hogs...at a small fraction of their cost. Delivers substantial, ongoing savings in operating costs. It offers a lower initial cost than competitive models and requires only 75 to 250 horsepower to grind up to 6 tons per hour. That means power consumption is lower without compromising high throughput. 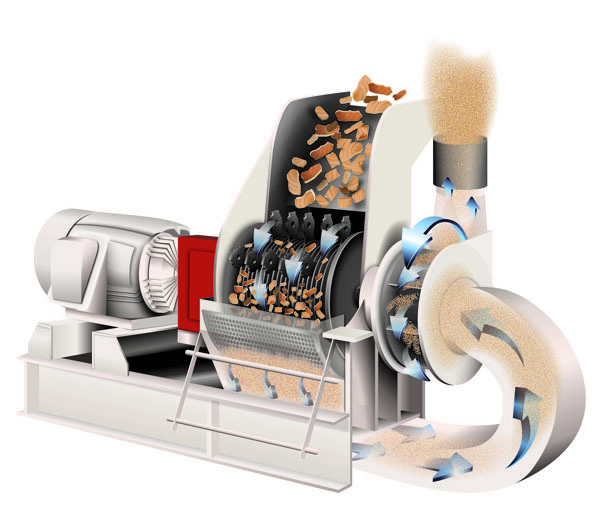 Wood trim scrap is fed horizontally into the mouth of the grinder, below the centerline. And because of the unique shape of the hammers - a Schutte exclusive - the material feeds itself, once inserted. No force is needed and no power rolls are required, as with other equipment. The self-feeding action is fast and positive for maximum efficiency. Features a range of screen/grates from 3/4" to 2" that produce a uniform product for profitable resale as a superior animal bedding or for mulch, boiler fuel and other applications. The screen/grate is easily removed for cleaning or replacement. If a virtually splinter-free, uniform grind is required, a new louvered bottom grate system of particle size control is available. Hinged drop~down cover permits complete access to hammers and bed knife for easy serviceability and maintenance. The cover drops down without disturbing the infeed throat.